Ireland's green fields, kind folks, and delicious beverages called to me ever since my visit to Northern Ireland in the early 2000s. So when Mrs. Tries expressed her desire to visit Ireland and retrace some of her ancestry, we pushed this country to the top of our travel wish list. We finally make the trek in the summer of 2013 as part of a trip that also brought us to Italy. Planning a trip is half the fun, and I took my planning game to the next level when masterminding this vacation. Using a piece of paper to represent each day, I turned our kitchen cabinets into a giant calendar so we could post our findings as we researched our destinations. 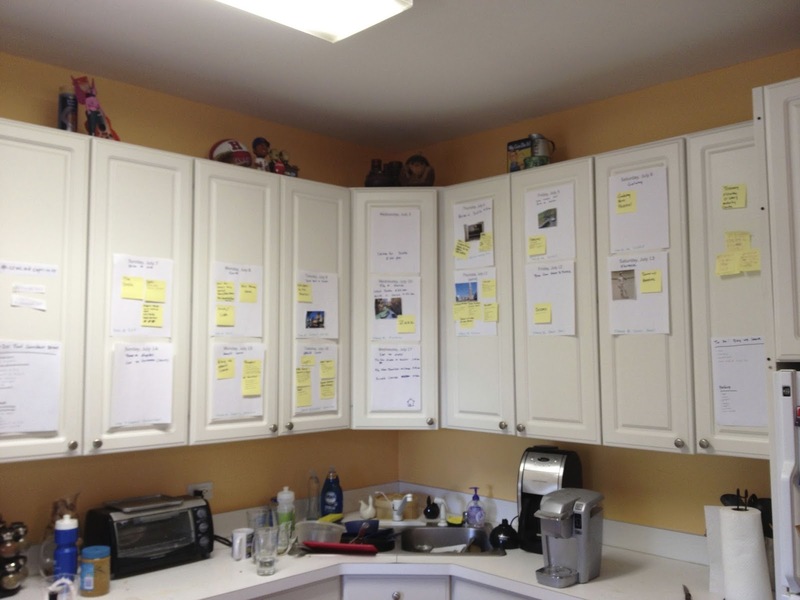 It helped us piece together our schedule, and kept the trip top-of-mind. Once the pieces (of paper) fell into place, our Ireland itinerary included a day in Dublin, a couple of days in Galway, a day to check out the Cliffs of Moher, and a couple of days in Cork before returning to Dublin for one more night. When July rolled around, it was time for our epic adventure. We headed to O’Hare airport with passports in hand and anticipation mounting. After a long but uneventful flight directly from Chicago to Dublin, we landed in Ireland tired, but excited. 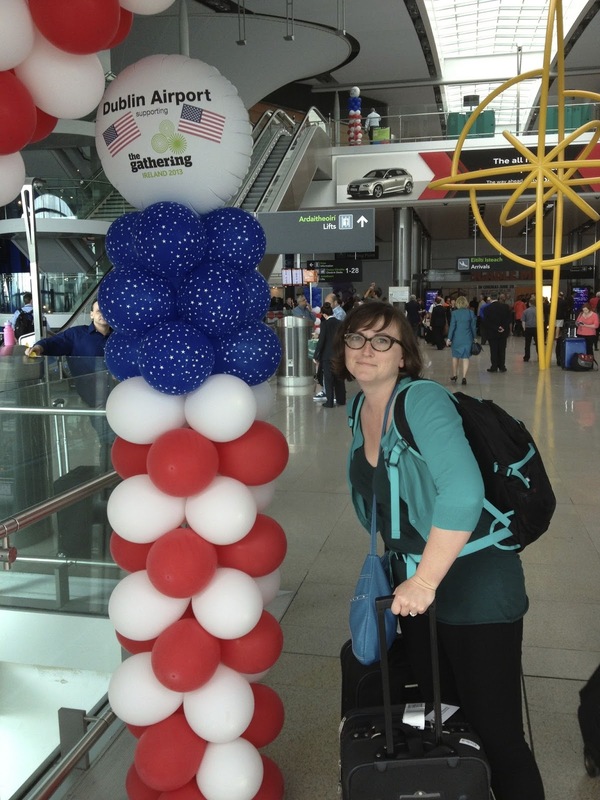 We touched down on the Fourth of July, and much to our surprise, the Dublin airport was covered in decorations celebrating America’s Independence Day. We had a laugh and a smile at this, as it was both totally absurd and oddly comforting. 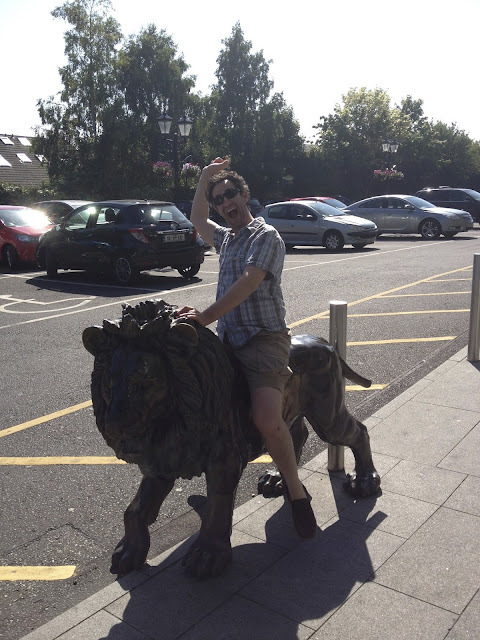 We took a cab from the airport to our hotel, and immediately we were greeted by Ireland’s signature friendliness. Our cab driver eagerly welcomed us and oriented us as we drove, pointing out things like a hotel owned by Bono of U2 fame. We arrived at the Morrison Hotel, and immediately we were taken by its stylish yet cozy motif. In addition to providing a great place to stay, the Morrison was within walking distance of many of Dublin's most famous attractions. We were so thrilled to be in Ireland, we skipped the nap we had planned, and hit the area surrounding our hotel to get the lay of the land. One place in particular caught our eye, the National Leprechaun Museum. We wondered how this place even existed, and with it located just a block from our hotel, we had to find out. As it turns out, the museum was an imaginarium of sorts featuring interactive exhibits and optical illusions. It was closed that day so we didn’t get to inquire further, but it looked like a cool place. From there we wandered over to the bridges that cross the River Liffey, which runs through the center of Dublin. There were many such bridges, several of which were intricately decorated. Our trek took us past establishments old and new, from ancient churches to modern sculptures. We could have wandered the streets for hours, but a highly anticipated destination called. Off we went to the Guinness Storehouse. It was a bit hard to find via GPS, but it was worth the confusion and then some when we got there. I didn't expect much more than a souped-up version of a brewery tour. However, the Guinness Storefront offered much more than that. Essentially, it was a museum, a bar, and an adult playground, all rolled into one. In addition to requisite exhibits such as how the company started and how their beer was made, installations on Guinness’ marketing, how the brand changed over time, its place in pop culture and more were housed within its walls. It even had some trick photography built in, which sent our funny photo-loving hearts aflutter. 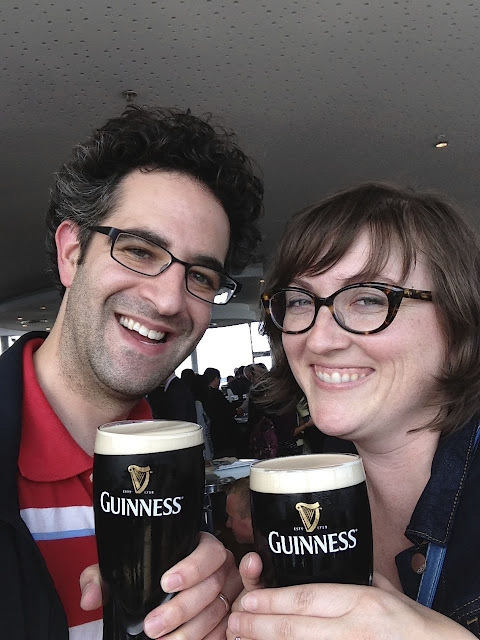 We also enjoyed learning how to pour the perfect pint of Guinness, a process far more intricate than need be, but more fun, too. The museum experience concluded at the Gravity Bar on the top floor. This glass-enclosed bar offered sensational views of the city, and the taps provided fresh Guinness to visitors. Our pints tasted creamy and distinguished, and the flavor was crisper than the Guinness in the US. We smiled ear to ear while we sipped our Guinness and looked over all of Dublin. 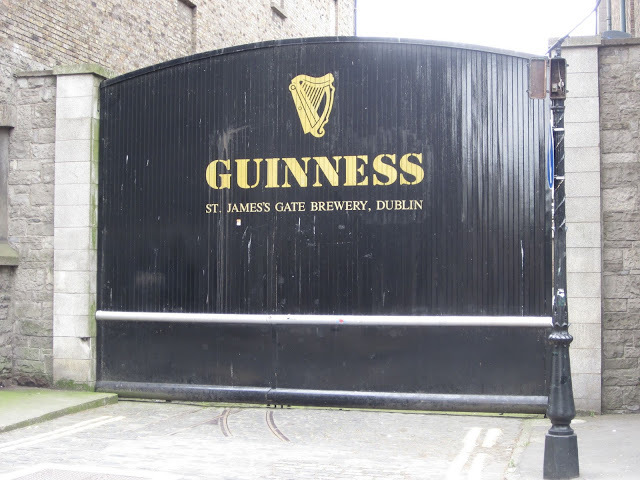 After a quick trip to the gift shop (which featured more Guinness memorabilia than we ever could have imagined), we left buzzing with excitement. 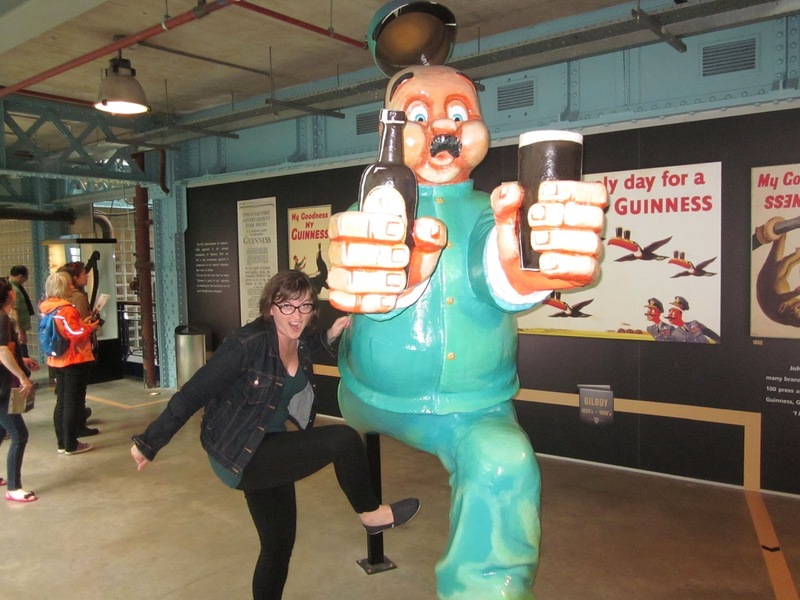 The Guinness Storefront turned out to be one of my favorite stops on the trip, and I whole-heartedly recommend it. 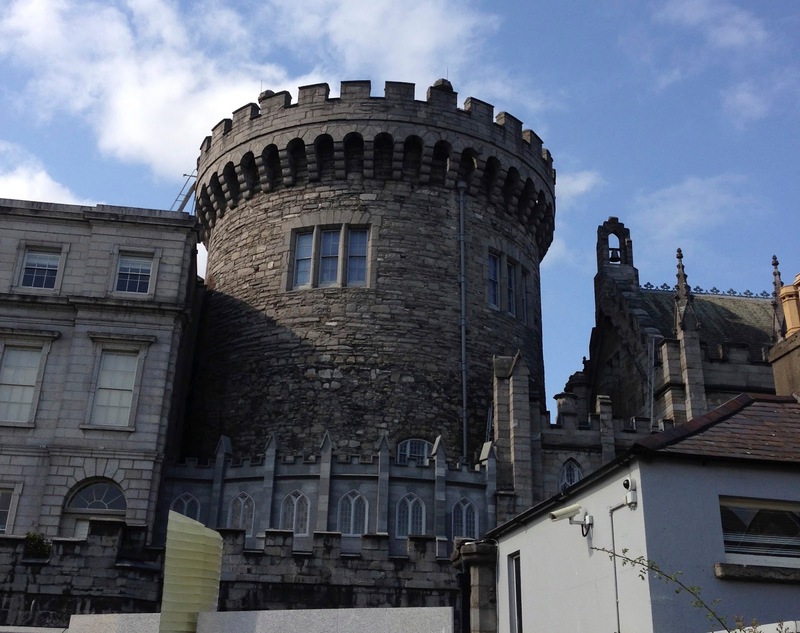 From there, we wandered back through Dublin, this time at a more leisurely pace. We enjoyed St. Patrick’s Cathedral and Christ's Church Cathedral from afar while we walked. We spent some time exploring the Chester Beatty Library, a free museum featuring ancient artwork and a tranquil rooftop garden. The type of art featured at the Chester Beatty Library was not my favorite, but nonetheless, we enjoyed our stroll through the exhibits. We also spent some time in Dubhlinn Garden, a circular park that sat between the library and Dublin Castle and provided an oasis from the surrounding city. Towards the end of the first full day of our trip, we found ourselves in a celebratory mood. 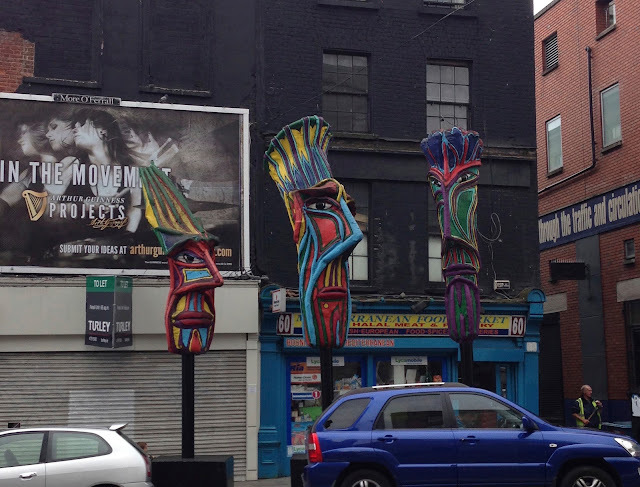 Fortunately, one of Dublin’s premier nightlife neighborhoods stood within stumbling distance of our hotel. 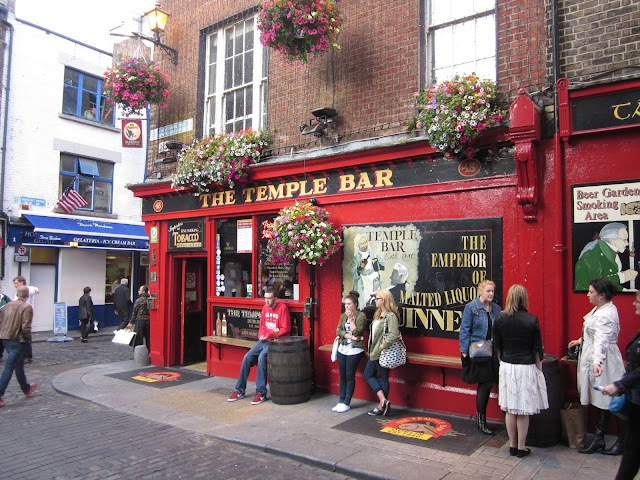 The Temple Bar neighborhood contained bars, restaurants, theaters, and other cultural points of interest. We targeted one of Temple Bar’s most famous bars - the Temple Bar Pub. This classic Irish pub featured an iconic red exterior, live music, and a loyal following. The huge crowd that night meant we had to fight for a table, but the struggle was worth it. We enjoyed a plate of bangers and mash, a couple of rounds of delicious beer, and some sensational people watching. The back of the menu laid out the bar’s history, and we were surprised to learn the establishment had a sister bar in Chicago. When we got back to Chicago, we realized the sister bar was catty-corner from our local grocery store. With our meals finished and our glasses empty, fatigue finally caught up to us, and we confessed we were too darn tired to hit up the other bars in the area. 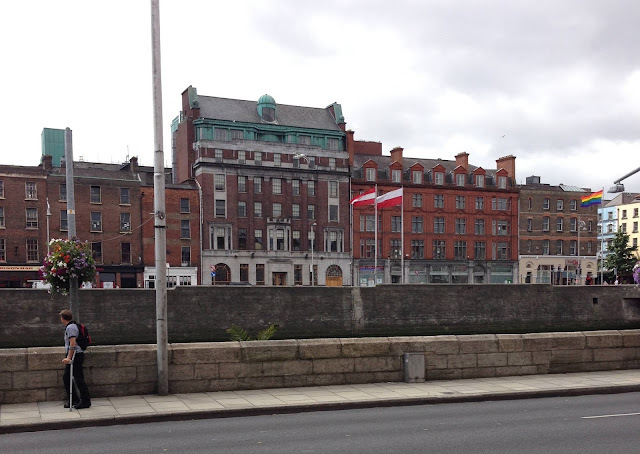 We made one last trek across the River Liffey, and then crashed hard in our comfy hotel bed. We’d need a full night’s sleep to tackle what lied ahead. 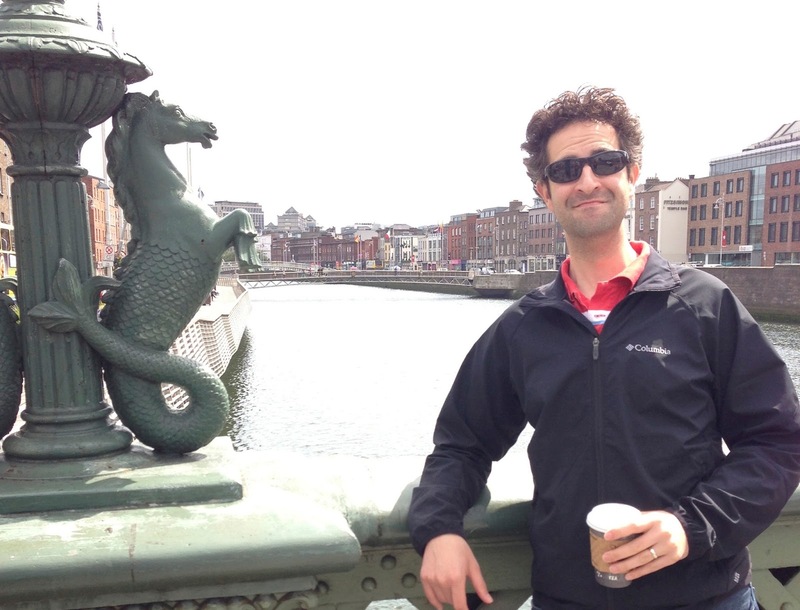 After a whirlwind trip around Ireland, we arrived back in Dublin a week later to spend one more night in the city. 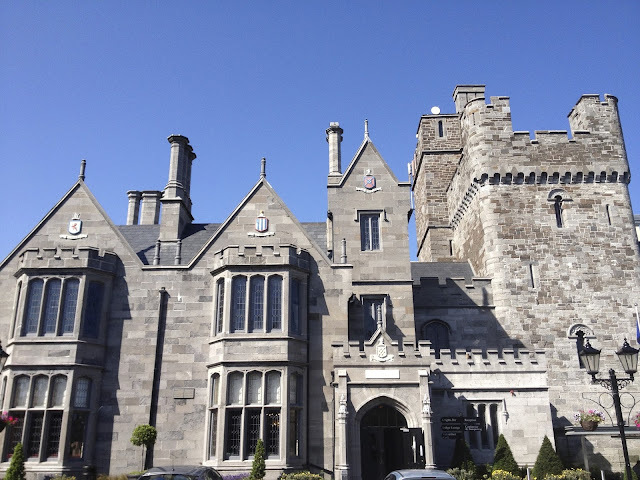 We didn't do much exploring that evening, but we had a blast checking out our hotel, the Clontarf Castle Hotel. This castle-turned-hotel straddled its past and present beautifully. Castle-themed decorations and props displayed throughout the hotel, which made for great photo ops. At the same time, the beds were comfy, the rooms were outfitted with wifi and plenty of outlets, and the restaurant included an outdoor patio and served delicious food. We spent a fun and relaxing evening there - the perfect ending to our time in Ireland. What happened in between our two stops in Dublin? Stay tuned to find out!